I was on an important mission to hunt for vintage Chanel in Paris while I was in this city of love on honeymoon. I’ve been a frequent pinner on Pinterest for a while. I was thrilled when I first explored Pinterest – finally there’s an awesome papaerless way to save and display all my favourite visuals! I used to keep folders of images that I cut out from fashion mags since I was a teenager and pinned them onto my wall facing my study desk. That was where my mind went for a feed and a bit of rejuvenation in between the boring studies! This morning I took some time to rearrange my pins and pin boards, and that was when I realized how much obsessions I have in life, and so much more are the little secret moments when I indulge in a bit of guilty pleasure. And immediately, this has inspired my blog content strategy. What’s a better way to write engaging blog posts than sharing my very own passion and obsessions? In the coming few weeks I shall share my rather long list of guilty pleasures to inspire, and to be inspired. Flashing back to my memories, my appreciation for vintage Chanel was nurtured when I was a teen, when my mum used to bring me to Hotel Peninsula in my hometown Hong Kong for afternoon tea regularly and we’d drop by the Chanel store in the hotel arcade for a treat for the eyes. Back in the 90s and even way before that, Chanel was all about the glitz and gold, the massive clip-on earrings and waist chains with chunky charms. Visiting Paris on honeymoon during Christmas last year, one of the most important mission I was on (that I didn’t tell my husband) was hunting for rare and unique vintage Chanel items. My research online brought me to Les 3 Marche des Catherine B in the chic suburb of Saint Germain des Prés in the 6th arrondissement of Paris. My eyes were glittering like a 5 year-old girl walking into a chocolate factory, and it didn’t take long till this beige quilted leather shoulder bag with tassles from the early 80s’ Chanel collection melted my heart. The easiest way to way to work vintage style into your wardrobe is to accessorize. I’ve picked up two other pieces of cuties, clip on earrings that can be worn for every occasions – team up with a little black dress for an evening dinner date, or with a white lace summer dress for the day for a bit of old Hollywood glamour. This little boutique stocks up to hundreds of styles of vintage Chanel as well as Hermes including bags, shoes, clothing and accessories, and it’s no doubt a Chanel lover’s paradise! Until next time, Catherine B. 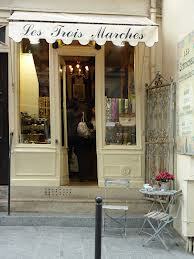 So tell me Dear Reader, what are your favourite vintage boutiques in Paris? Share your insider’s tips in the comment below! Also check out my Buying Vintage Chanel in Paris Guide Part 1 and Part 2. Hi Catherine, I am coming to Paris in three weeks and my plan is to visit your store. I can’t wait to search for my perfect vintage Chanel bag! Love the earrings!!!! darn cute!!! Great Tip… we will have to check this place out in a couple of weeks when we are in Paris next! Look out for our post on Pairs flee markets we will be doing when we are there…. any other Paris tips you have we would love to hear about them. Wow! I like your style…& such a beautifully presented blog you have. Ooh that’s so kind of you Harry, and thanks for the visit to my blog! I’ve spend way too much time to fine tune the layout and design of my blog for the best user experience, and there’s so much more on my to do list. I like the artistic look and feel of your blog too. As always, this is just great! Thanks for another visit to my blog, and for the store reference. I’ll check to be sure that it’s already in my book and, if not, will add it. Best . . . .. . .
No plans at present, but it’s on the agenda. Can hardly wait! I hear you! I wanted to pack all goodies home with me, good condition and authentic vintage Chanel are rare finds these days, Parisian girls are lucky! love this article. 🙂 faaaab! Merci, Juliet – happy to hear you enjoyed your recent visit and hope you can get back again. It is indeed a great place to live! Thanks for liking my bear sculpture post. What a different world you are in! I am so happy to read of this place! I love the older work of great designers and have often wondered where one would find vintage Chanel (and others). Thank you for the inspiration! Afternoon tea at the Peninsula is one of my favourite things too! It’s definitely one of the few places where you can still get the vibe of the old grand colonial Hong Kong! The only thing is that now it’s listed in every travel guide book the queue for a table is insane! Yes that is true-esp on weekends! Thank you Juliet for checking out my blog. I really enjoyed your post and getting to Pairs to check out Les 3 Marche des Catherine B is on the top of my list. A friend of mine recently moved to the states from Paris. If she has any suggestions for places to visit I will let you know. Thanks for the hint – that will come useful on the next trip to Paris! It’s great to meet you too! My blog is chicadventures.wordpress.com if you’d like to check it out. I look forward to your fashionable adventures! What an awesome shop. One day, I’ll get there too. Love your blog. The shop is totally a candy store for vintage Chanel lovers! Definitely get it added to your travel bucket list! Hi! Lovely items, you have a really good eye for unique vintage Chanel items. I wanted to ask if its ok, what is the price range in this store! Thanks for your compliment Daniella. I just go with my first impression when I go vintage hunting, I think it’s all about that ‘wow’ moment that strikes at first sight, almost like a first date haha! Their Chanel bags are around mid to top tier price range but obviously it comes with quality so I’d say it’s resonably priced considering the quality. I paid around 1200 Euro for my beige sheep skin chain bag. What a wonderful shopping discovery! The images are all beautiful — coming up with a plan to visit Paris with my beloved. Thanks for checking out my blog! It’s so generous of you to share a gem like this with the rest of us. I’m not sure I would have been able to resist keeping it a secret! Thanks for stopping by! Lovely blog! Great blog! I’ll be back in Paris in a month, I love vintage shopping through the flea markets for old Parisian dresses! I imagine this shop would slightly extend my budget though!! Lovely writing, I can tell its authentic. Loved the cute Parisian photos too. Love the bag! I also love that emerald green bag on the shelf. If you don’t mind me asking, what was the price range for Chanel bags at Catherine B? I bought my first piece in 1969 and haven’t looked back since! Thanks for stopping by my blog, when the French house project is nearer finished I will be setting up my online vintage accessories and home shop so keep looking! I wish I own all the Chanel and Hermes in that shop!! Thanks for this! On the hunt for a Black & Gold Maxi Flap bag <3 CANT WAIT TO HUNT FOR CHANEL IN HER HOME!! ! Vintage isn’t just about age, it’s a style and elegance and your post really shows that…..thank you. And, give me No.5 any time. So glad to meet fellow vintage lover who appreciates the timeless elegance that comes with age, it’s almost like whisky, really! Paris in 1930’s glamour, oh the urge to revisit this soulful city is getting incurable! Thank you for liking my photo essay on Tasman National Park. What a great find! I am going to check out the link! I’ve always been into vintage. It’s a great way to tweak your own style! Hello, I love your blog (especially this post) I am trying to save to buy my first high end designer handbag while I am in Paris this spring. I was wondering what is the price range for Chanel bags at Catherine B’s. Maybe single flap small or medium size, not much larger than that.. Thanks So Much!! Do you happen to know the name of the vintage store down the street? Or do you have any other recommendations on stores? Hey Kate, I think it’s called Divine Parisienne at 19 Rue Guisarde (same street). How much does the chanel jewelry normally run – like the earrings bracelets and necklaces?